CAST your mind back to your earliest memories and mum or dad dropping you off by the school gates. What car was it? Commodore wagon? Busted up Ford Falcon or maybe even one of those exotic Japanese imports like a Toyota Corolla or Mazda 323? Instead, these days it's commonplace to have a herd of SUVs clogging the roads around schools. Sure, the Toyota, Mazda and Hyundai high-riders are most popular, but you barely raise an eyebrow at anything premium: BMW X5s, Volvo XC90s and Audi Q5s are ubiquitous big things. Porsche Cayenne or Macan SUV? Nice, but we've seen it all before. No, for sheer school gate snobbery there's little to touch a Maserati. 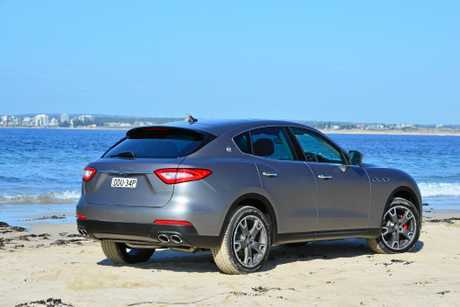 And with the arrival of the Levante SUV for not a great deal more than the premium Germans, the allure of that exotic Italian Trident badge mated to SUV all-wheel drive family-friendliness has strong pull indeed. In the metal the Levante is achingly desirable. Long yet sporty with its coupe style and muscled wheel arches, and with signature imposing front grille and skinny feline-esque headlights it draws stares like no other SUV. Now the price: $140,000 is a lot of money, but that makes the entry-level Levante the same coin as Maserati's own Ghibli sedan. There's little doubt which of these two will be Maser's best-seller this year. There's understated elegance inside. It's soft touch everywhere with leather coating every part of the seats, doors and dashboard, but it's not excessively opulent. 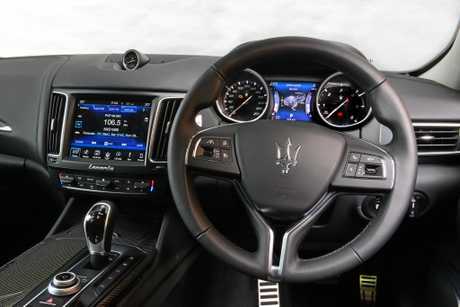 The centre console design is clean and unfussy with a central 8.4-inch touchscreen, and traditionalists will rejoice at the blue analogue Maserati clock in the dash centre. Cabin space is decent - especially for the rear passengers despite the coupe-esque roof. 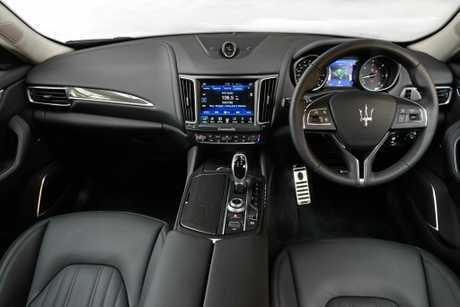 Yes there's leathery loveliness throughout on the base Levante as standard, but you really need to dig deep to score 'proper' Maserati luxury. Carbon fibre trim is $8400, 'full natural leather' an extra $9085, and it's $1137 if you want stitched Trident logos in your seats. We scored decent wheel time across all manner of roads in the Levante: city traffic, freeway, cracked back roads, private bitumen test track and a mild off road course. The 3.0-litre diesel offers ample shove thanks to that 600Nm of torque, but the Levante is by no means a quick car. Positively, the diesel sound is a tasty one, making up somewhat for there being no roaring Maserati petrol growl. It really is a lovely thing to live with on good roads, and at its best as a cruiser. On the highway it wafts along in high-riding comfort and you only feel the really bad road imperfections - more so if you option the larger 20-inch or 21-inch wheels. Nudge it into Sport mode and the Levante's comparatively low centre of gravity means it hides its weight well in the turns, there's excellent balance and the hydraulic steering offers a surprisingly good amount of feedback. 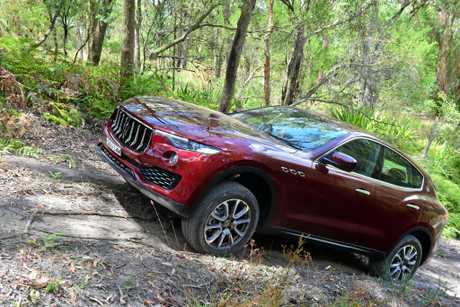 The air suspension gives the SUV a decent 274mm ground clearance, and our off-road test proved Maserati's first SUV effort has no need to hide from the rough stuff. 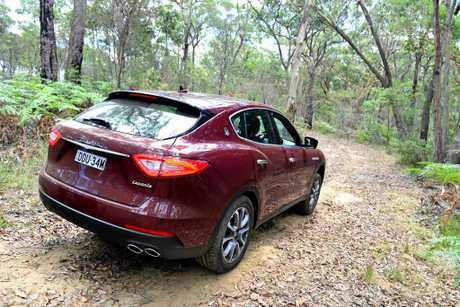 It'll look more at home at fancy ski resorts than bush bashing, but the clever 4WD system and hill descent control meant the Levante made short work of loose surfaces and hill climbs. A fly in the ointment is engaging Drive or Park is harder than it need be. The 2017 Maserati Levante goes off-road. All Levantes do well on the spec front, highlights including rear parking camera, decent active safety kit (like adaptive cruise and blind sport alert), 19-inch alloys, dual zone climate, navigation, leather upholstery, power tailgate and 12-way power front seats. Those seeking more pampering can drop an extra $20k on the Levante Luxury and enjoy Alcantara roof lining, power steering column, panorama glass sunroof, 20-inch alloys, more premium leather and Harman Kardon sounds. The Levante Sport gets the same H/K sound system and power adjustable steering, gear shift paddles (which should really be standard across the range - it's a Maserati! ), 21-inch alloys, sportier seats, steering wheel and pedals, plus a Sport spoiler and red brake callipers. The Levante may be a large SUV but there's no option for seven seats here: the nanny will have to follow in her Yaris. Keyless entry and power tailgate are expected but appreciated inclusions, while the cabin centre console has two storage bins (one nicely deep for your phone, wallet and glasses), plus a smidge more under the leathery centre armrest. We can lament the fact there's no snorting and tuneful petrol engine (the aural treat has always been a huge Maserati drawcard), but positively that diesel motor returns a more frugal 7.2-litres/100km. Chief rival is the Range Rover Sport - the SDV6 HSE is close at $130,100 - while Porsche's Cayenne offers serious diesel clout with its 4.2-litre S Diesel model for $144,400. 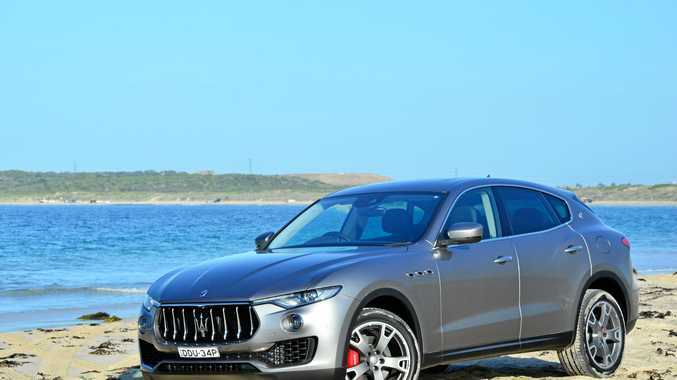 No Maserati Levante will be climbing mountains, but it would be too easy to write this luxury SUV off purely as yummy mummy private school fodder, although it will do that superbly. Decent off-road ability and 2700kg towing capacity means the Levante can plough through muddy fields to the pony club or will tow a decent size boat, and on our test it proved it had enough performance and handling balance to (just about) honour the Maserati badge. Price: $139,990 (Levante); $159,990 (Sport); $159,990 (Luxury). Details: Five-door, five-seat all-wheel-drive premium large SUV. Engine: 3.0-litre turbocharged V6 diesel 202kW/600Nm. What we liked: Exclusivity, striking standout coupe SUV styling, interior space, can do the off-road bit, well balanced for a heavy car, good value for a Maserati badge. 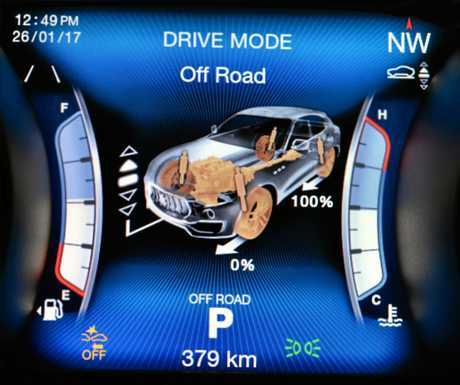 What we'd like to see: Less expensive options and the likes of gear shift paddles should be standard; a V8 petrol hero model would make it more 'true' Maserati; gear selector is too clunky. Warranty and servicing: Three year/unlimited km warranty. Servicing is every 20,000km.